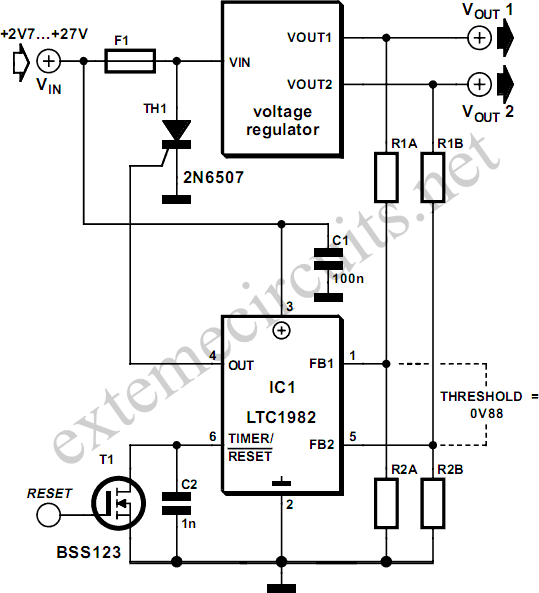 When a sensitive circuit must under no circumstances have too high a supply voltage applied, then some means of disconnecting the supply must be provided. One way to achieve this is to trigger a thyristor to blow a fuse. A less destructive alternative possibility is to use a MOSFET to disconnect the supply. An over-voltage protection IC, the LTC1696 from Linear Technology (www.linear-tech.com), has recently become available, which is suitable for triggering and driving such a device. 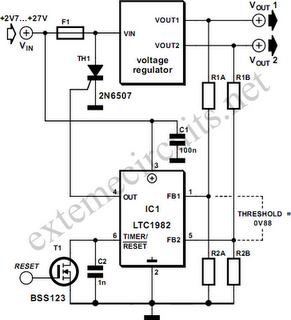 It operates from a power supply in the range 2.7 V to 27 V and can be connected to the unregulated input of a voltage regulator. Two voltages can be monitored using feedback pins FB1 and FB2, suitably divided down using potential dividers. The trigger threshold for both FB1 and FB2 is +0.88 V. The value of the upper resistor in the potential divider can be calculated using the following formula: R1 = 33 kΩ× [(VLIMIT – 0.88 V)/0.88 V] The value of the capacitor connected to the TIMER/RESET pin sets the delay before the protection is triggered. The charging current for this capacitor depends non-linearly on the amount by which the voltage exceeds the threshold value. The greater the over-voltage, the faster the IC triggers. Once triggered the IC remains in that state until either the input voltage is removed or the internal latch is cleared using the MOSFET connected to the TIMER/RESET input.